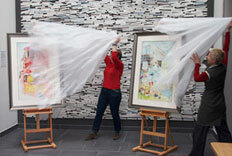 Today saw the unveiling of the two extremely large watercolour paintings for the new NHS Southmead Hospital in Bristol. This £430 million hospital redevelopment project for North Bristol NHS Trust working in conjunction with Carillion, i s due to open fully in 2014. Joanna was commissioned by Davis&Jones to participate in working with a wide range of people involved with the Southmead Project. This ranged from attending operations to attending construction site meetings. The interaction with all of the different people involved with this huge construction project was to be the inspiration behind the artworks created. The results were two unique paintings, due to the way that they blend the construction of the human body with the construction of the hospital building. Aptly named Body Builders and A Joint Operation, one uses the building as the backdrop and adds in elements of human anatomy and medical practice; the other takes human anatomy and brings in elements of construction and day to day life of a hospital. See the full review and the two paintings here.